Curricular Classes - ​Vivekananda Vidyapith Inc. Classes are held Saturdays and Sundays from 9:00am- 1:00pm for youngsters from Kindergarten to 12th Grade. Inspiring thoughts, the Bhagavad Gita, biographies of great personalities, and stories from the Upanishads, Ramayana and Mahabharata are taught in an interesting way that appeals to young minds. Music, Sanskrit, shlokas, world religions, and Indian history are also integral parts of the curriculum. Scriptural study classes are held Monday and Thursday evenings for adults. 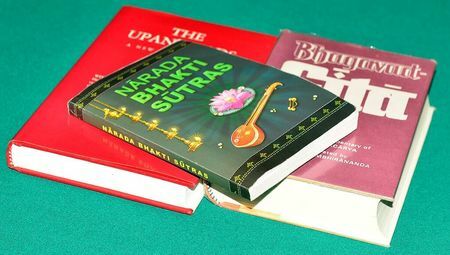 The classes include reading and group discussions on The Gospel of Sri Ramakrishna, Bhagavad Gita, Upanishads, and Vedanta as expounded by Sri Ramakrishna Paramahamsa and Swami Vivekananda. Practicing the ideals of the scriptures is emphasized in these classes.